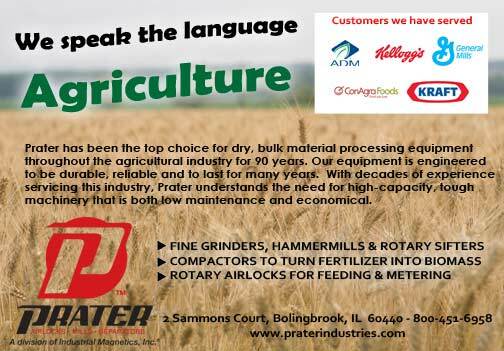 Prater has been the top choice for dry, bulk material processing equipment throughout the agricultural industry for 90 years. Our processing equipment designed and produced specifically for the agriculture industry is ideal for grinding, milling, sifting, feeding and batching. Many customers throughout the world rely on our machinery to facilitate the easy, efficient processing of materials. Some of our most popular agricultural processing equipment includes fine grinders, hammermills and rotary airlocks for processing materials such as wheat, grain, corn, oats, barley, sugar cane, maize, fertilizer, fibers, plants, raw materials and biomass. Contact Prater today to discuss your agricultural business processing needs. We will work with you to determine what equipment is best suited for your company’s application and will provide effective solutions.